You can export your entire album collection or just part of your collection to a TXT file. The export to text screen offers a wide variety of options to customize your exported list completely. For example, you can if you want, export only a selection of your albums (for instance, just your wish list), and only export the Title and Genre fields for each album and in your preferred set sort order too. Click the menu icon top left and click “Export to Text File” to enter the export screen. You can now set up your document at the top with all the optional settings. Also use the “Add sort fields” button to select which fields you wish to sort on. This decides the order in which the albums are listed. Finally, use “Generate file” at the bottom to create your text file. Maybe you just want to print out a small selection of your albums to a text file. Maybe just your albums with their format set to “Vinyl”. In that case, you need to make a selection of albums first and then go to the Export to Text File screen. To begin, you need to select the albums you want to send to the text file. To select albums, click the checkboxes on the left of each album entry in the list. Checkboxes are also available in Card View and Images View, just hover your mouse over an album. The Select Mode is automatically activated as soon as you checkbox the first album, clearly indicated by the blue Batch Action Bar that replace the regular toolbar. Now click “Export” in the blue Batch Action Bar to enter the PDF settings screen. 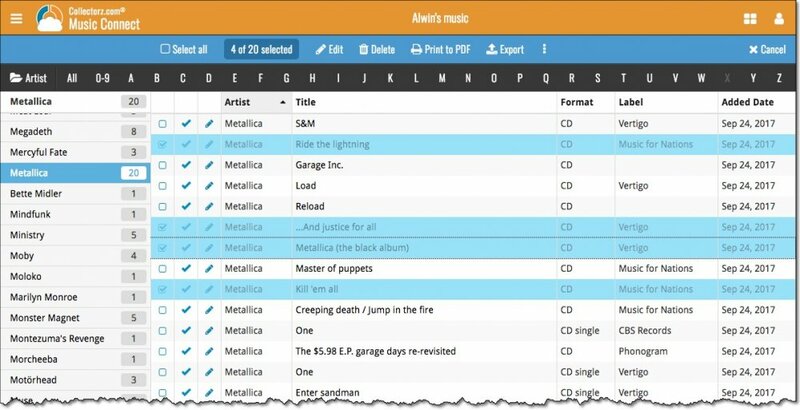 Set up your document with the columns and sorting options you wish to use and finally use the “Generate file” at the bottom to create your text file with just the selection of albums you made. *While in “Select Mode”, you can use shift clicking to select ranges of albums, or the Select All button top left to select all albums in your current list.